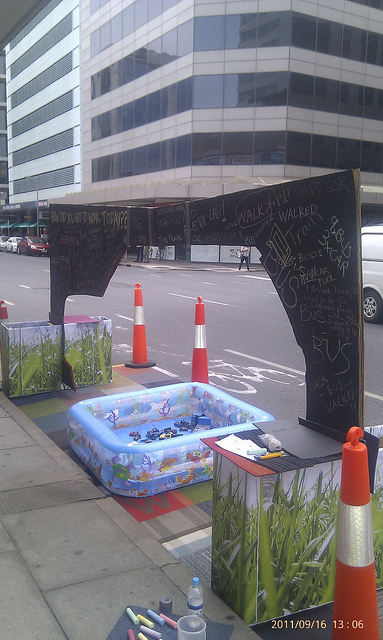 Originally a project out of San Francisco, PARK(ing) Day is now a global event. Photo by Gosia Malochleb. A version of this post was orginially published by Maria Fernanda Cavalcanti on September 16, 2011 in Portuguese in TheCityFix Brasil. 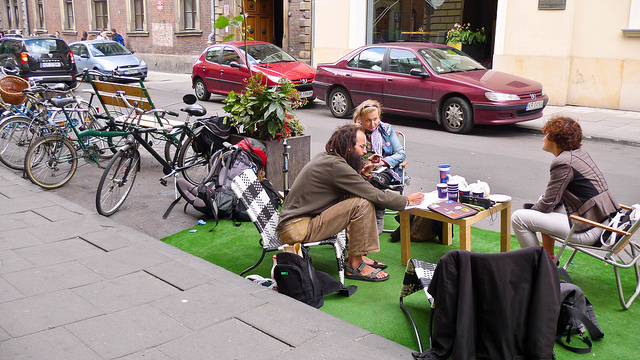 Today marks the seventh annual celebration of PARK(ing) Day, when citizens, artists, students and activists take over metered parking spaces and transform them into temporary public parks or other spaces for people to enjoy. 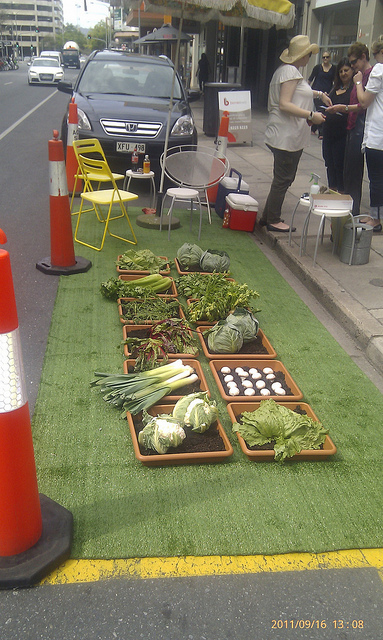 The PARK(ing) project originally started in 2005 by transforming a single metered parking space into a temporary public park in an area of San Francisco that the city had designated as lacking public open space, explains the project’s website. 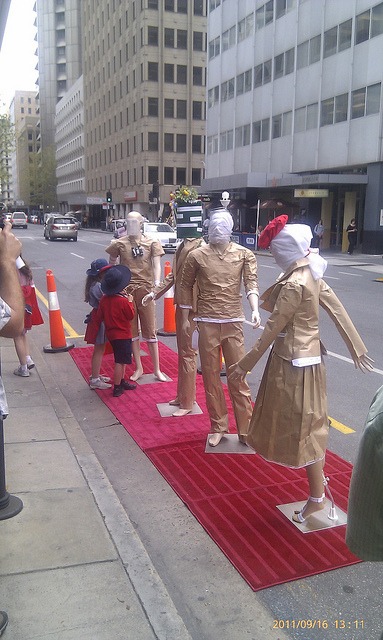 Today, PARK(ing) day has spread to cities all around the world, with many sponsors in the sustainable transport world. One day a year, parking spaces are completely occupied by grass, benches, trees and people enjoying the space as if it were a real park in which to chat and relax. The action, which takes place in more than 200 cities around the world, is a major criticism of the lack of legal urban spaces for social interaction and the large number of car parking. The initiative was born in San Francisco, through the architectural firm Rebar. The official website of Park(ing) Day is full of information about the event and a map of all registered spaces around the globe. In Brazil the demonstration will be represented only in the city of Rio de Janeiro. Studio X of Columbia University, along with a group of architects and partners, holds a seat in front of the Praça Tiradentes, where lectures will be held outdoors during the evening where participants can set up a lounge for socializing. Transport Activity will also ride the Wave Live at Rua Senador Dantas in front of the Poets Lane Sidewalk for the fifth consecutive year. TA will install synthetic grass, plants and chairs for those who want to enjoy the center of Rio without a car. Above photos by Royston Rascals.